Looking for a clean, well-cared for 2014 Toyota Camry? This is it. If you are looking for a vehicle with great styling, options and incredible fuel economy, look no further than this quality automobile. You can tell this 2014 Toyota Camry has been pampered by the fact that it has less than 71,349mi and appears with a showroom shine. The interior of this Toyota Camry LE has been through meticulous inspection and could almost pass for a brand new vehicle. More information about the 2014 Toyota Camry: The Toyota Camry has been America's top-selling passenger car for the past nine years, and for good reason, as it's known for providing its owners with comfort, economy and reliable service. But recent styling updates make it even more appealing to buyers. It's strong competition in the midsize segment thanks to a reputation for quality and value per dollar. This model sets itself apart with V6 and hybrid versions available, impressive interior space and ride quality Thank you for taking the time to review one of our pre-owned vehicles. We have many! As one of the largest pre-owned dealerships in Rhode Island, we are committed to providing you with a purchase experience that will WOW you. If we fail to meet your expectations in any way...please let me know. Thank you. Mike O'Connell, General Manager. 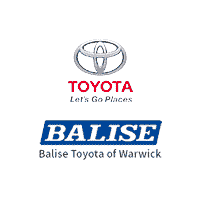 Thank you for your interest in one of Balise Toyota of Warwick's online offerings. Please continue for more information regarding this 2016 Toyota Camry LE with 36,277mi. Enjoy an extra level of calm when purchasing this Toyota Camry LE, it's a Autocheck One-Owner. The Autocheck report shows everything you need to know to confidently make your pre-owned purchase. It's not a misprint. And the odometer isn't broken. This is a very low mileage Toyota Camry. A rare find these days. This Toyota Camry LE is in great condition both inside and out. No abnormal wear and tear. The Toyota Camry has been the best-selling car in America for twelve years now. The Camry is a massive success and with good reason -- it's got proven reliability, a quiet and spacious interior, good fuel economy and exciting exterior styling. For anyone who needs quiet, comfortable transportation for up to five people without breaking the bank, the Camry is invariably the place to start the search. The Camry offers a ton of versatility for the price, but can also be optioned up to give buyers that luxury car feel if they so desire. Thank you for taking the time to review one of our pre-owned vehicles. We have many! As one of the largest pre-owned dealerships in Rhode Island, we are committed to providing you with a purchase experience that will WOW you. If we fail to meet your expectations in any way...please let me know. Thank you. Mike O'Connell, General Manager. This 2016 Toyota Camry SE is proudly offered by Balise Toyota of Warwick Autocheck shows that this is a one-owner vehicle -- no wonder it's in such great condition. It's not often you find just the vehicle you are looking for AND with low mileage. This is your chance to take home a gently used and barely driven Toyota Camry. Looking for a Toyota Camry that is in great condition inside and out? Take a look at this beauty. The Toyota Camry has been the best-selling car in America for twelve years now. The Camry is a massive success and with good reason -- it's got proven reliability, a quiet and spacious interior, good fuel economy and exciting exterior styling. For anyone who needs quiet, comfortable transportation for up to five people without breaking the bank, the Camry is invariably the place to start the search. The Camry offers a ton of versatility for the price, but can also be optioned up to give buyers that luxury car feel if they so desire. Thank you for taking the time to review one of our pre-owned vehicles. We have many! As one of the largest pre-owned dealerships in Rhode Island, we are committed to providing you with a purchase experience that will WOW you. If we fail to meet your expectations in any way...please let me know. Thank you. Mike O'Connell, General Manager. Contact Balise Toyota of Warwick today for information on dozens of vehicles like this 2016 Toyota Camry LE. Looking for a one-owner vehicle? You've found it. Autocheck shows this vehicle was owned by the original buyer. Low, low mileage coupled with an exacting maintenance program make this vehicle a rare find. Beautiful exterior. Clean interior. This Toyota Camry is so immaculate it is practically new. The Toyota Camry has been the best-selling car in America for twelve years now. The Camry is a massive success and with good reason -- it's got proven reliability, a quiet and spacious interior, good fuel economy and exciting exterior styling. For anyone who needs quiet, comfortable transportation for up to five people without breaking the bank, the Camry is invariably the place to start the search. The Camry offers a ton of versatility for the price, but can also be optioned up to give buyers that luxury car feel if they so desire. Thank you for taking the time to review one of our pre-owned vehicles. We have many! As one of the largest pre-owned dealerships in Rhode Island, we are committed to providing you with a purchase experience that will WOW you. If we fail to meet your expectations in any way...please let me know. Thank you. Mike O'Connell, General Manager. Contact Balise Toyota of Warwick today for information on dozens of vehicles like this 2017 Toyota Camry LE. This well-maintained Toyota Camry LE comes complete with a Autocheck one-owner history report. The Camry LE is well maintained and has just 28,258mi. This low amount of miles makes this vehicle incomparable to the competition. This Toyota Camry LE is in great condition both inside and out. No abnormal wear and tear. The Toyota Camry has been the best-selling car in America for twelve years now. The Camry is a massive success and with good reason -- it's got proven reliability, a quiet and spacious interior, good fuel economy and exciting exterior styling. For anyone who needs quiet, comfortable transportation for up to five people without breaking the bank, the Camry is invariably the place to start the search. The Camry offers a ton of versatility for the price, but can also be optioned up to give buyers that luxury car feel if they so desire. * Reliable * aggressive styling * comfortable * spacious * efficient Thank you for taking the time to review one of our pre-owned vehicles. We have many! As one of the largest pre-owned dealerships in Rhode Island, we are committed to providing you with a purchase experience that will WOW you. If we fail to meet your expectations in any way...please let me know. Thank you. Mike O'Connell, General Manager. Check out this gently-used 2016 Toyota Camry we recently got in. This Toyota includes: MOONROOF PACKAGE *Note - For third party subscriptions or services, please contact the dealer for more information. * This vehicle has extremely low mileage on the odometer, so while it's pre-owned, it's practically new. If not for a few miles on the odometer you would be hard-pressed to know this 2016 Toyota Camry is a pre-owned vehicle. The Toyota Camry has been the best-selling car in America for twelve years now. The Camry is a massive success and with good reason -- it's got proven reliability, a quiet and spacious interior, good fuel economy and exciting exterior styling. For anyone who needs quiet, comfortable transportation for up to five people without breaking the bank, the Camry is invariably the place to start the search. The Camry offers a ton of versatility for the price, but can also be optioned up to give buyers that luxury car feel if they so desire. Thank you for taking the time to review one of our pre-owned vehicles. We have many! As one of the largest pre-owned dealerships in Rhode Island, we are committed to providing you with a purchase experience that will WOW you. If we fail to meet your expectations in any way...please let me know. Thank you. Mike O'Connell, General Manager. Contact Balise Toyota of Warwick today for information on dozens of vehicles like this 2017 Toyota Camry SE. This Toyota includes: MOONROOF PACKAGE Driver Vanity Mirror Passenger Vanity Mirror Generic Sun/Moonroof Passenger Illuminated Visor Mirror Sun/Moonroof Driver Illuminated Vanity Mirror BODY SIDE MOLDINGS (PPO) RADIO: ENTUNE PREMIUM AUDIO W/NAVIGATION/APP SUITE Smart Device Integration HD Radio Navigation System CD Player AM/FM Stereo Satellite Radio Auxiliary Audio Input MP3 Player *Note - For third party subscriptions or services, please contact the dealer for more information. * Rare is the vehicle that has been driven so gently and maintained so meticulously as this pre-owned beauty. Performance, ease of use and efficiency are just a few reasons you'll love the navigation system that comes with this car. The Toyota Camry has been the best-selling car in America for twelve years now. The Camry is a massive success and with good reason -- it's got proven reliability, a quiet and spacious interior, good fuel economy and exciting exterior styling. For anyone who needs quiet, comfortable transportation for up to five people without breaking the bank, the Camry is invariably the place to start the search. The Camry offers a ton of versatility for the price, but can also be optioned up to give buyers that luxury car feel if they so desire. * Reliable * aggressive styling * comfortable * spacious * efficient Thank you for taking the time to review one of our pre-owned vehicles. We have many! As one of the largest pre-owned dealerships in Rhode Island, we are committed to providing you with a purchase experience that will WOW you. If we fail to meet your expectations in any way...please let me know. Thank you. Mike O'Connell, General Manager. Thank you for your interest in one of Balise Toyota of Warwick's online offerings. Please continue for more information regarding this 2017 Toyota Camry LE with 5,231mi. This well-maintained Toyota Camry LE comes complete with a Autocheck one-owner history report. This Toyota Camry is beautiful and the interior is clean with virtually no flaws. Just what you've been looking for. With quality in mind, this vehicle is the perfect addition to take home. The Toyota Camry has been the best-selling car in America for twelve years now. The Camry is a massive success and with good reason -- it's got proven reliability, a quiet and spacious interior, good fuel economy and exciting exterior styling. For anyone who needs quiet, comfortable transportation for up to five people without breaking the bank, the Camry is invariably the place to start the search. The Camry offers a ton of versatility for the price, but can also be optioned up to give buyers that luxury car feel if they so desire. * Reliable * aggressive styling * comfortable * spacious * efficient Thank you for taking the time to review one of our pre-owned vehicles. We have many! As one of the largest pre-owned dealerships in Rhode Island, we are committed to providing you with a purchase experience that will WOW you. If we fail to meet your expectations in any way...please let me know. Thank you. Mike O'Connell, General Manager. You can find this 2016 Toyota Camry XSE and many others like it at Balise Toyota of Warwick. This Toyota includes: MOONROOF PACKAGE RADIO: ENTUNE PREMIUM AUDIO W/NAVIGATION/APP SUITE This Toyota Camry has been loved by its original owner as Autocheck shows it to be a one-owner. It's not often you find just the vehicle you are looking for AND with low mileage. This is your chance to take home a gently used and barely driven Toyota Camry. Added comfort with contemporary style is the leather interior to heighten the quality and craftsmanship for the Toyota Camry Pre-owned doesn't have to mean used. The clean interior of this Toyota Camry makes it one of the nicest you'll find. Why go with a basic vehicle when you can have it all in this well-optioned Toyota Camry? This Toyota Camry is equipped with navigation, so you no longer have to wonder if you're headed in the right direction. This incredibly rare Toyota Camry XSE is a work of art and is the type of vehicle a true automotive aficionado will appreciate for a lifetime. Upgraded wheels enhance the look of this Toyota Camry. The Toyota Camry has been the best-selling car in America for twelve years now. The Camry is a massive success and with good reason -- it's got proven reliability, a quiet and spacious interior, good fuel economy and exciting exterior styling. For anyone who needs quiet, comfortable transportation for up to five people without breaking the bank, the Camry is invariably the place to start the search. The Camry offers a ton of versatility for the price, but can also be optioned up to give buyers that luxury car feel if they so desire. Thank you for taking the time to review one of our pre-owned vehicles. We have many! As one of the largest pre-owned dealerships in Rhode Island, we are committed to providing you with a purchase experience that will WOW you. If we fail to meet your expectations in any way...please let me know. Thank you. Mike O'Connell, General Manager. Check out this gently-used 2014 Toyota Corolla we recently got in. Save money at the pump with this fuel-sipping Toyota Corolla. This Toyota Corolla L is in great condition both inside and out. No abnormal wear and tear. Based on the superb condition of this vehicle, along with the options and color, this Toyota Corolla L is sure to sell fast. More information about the 2014 Toyota Corolla: The Corolla has been volume leader for Toyota for several years, and the latest version offers buyers even more bang for their buck. In a crowded compact segment, against the Honda Civic, Nissan Sentra and Ford Focus, the new Corolla stands out for its fresh, athletic styling, as well as its roomy, feature-rich interior. The new LE Eco offers best-in-class fuel economy. Add Toyota's outstanding reputation for reliability, and the new Corolla deserves a place at the top of every compact car-shopper's list. Strengths of this model include reliability, fuel efficiency, Sporty looks, affordability, and standard features Thank you for taking the time to review one of our pre-owned vehicles. We have many! As one of the largest pre-owned dealerships in Rhode Island, we are committed to providing you with a purchase experience that will WOW you. If we fail to meet your expectations in any way...please let me know. Thank you. Mike O'Connell, General Manager. Balise Toyota of Warwick is honored to present a wonderful example of pure vehicle design... this 2016 Toyota Corolla LE only has 56,886mi on it and could potentially be the vehicle of your dreams! Outstanding fuel economy and sleek styling are two great reasons to consider this Toyota Corolla. Looking for a Toyota Corolla that is in great condition inside and out? Take a look at this beauty. Beautiful color combination with Brown Sugar Metallic exterior over Amber interior making this the one to own! More information about the 2016 Toyota Corolla: The Corolla has been volume leader for Toyota for several years, and the latest version offers buyers even more bang for their buck. In a crowded compact segment, against the Honda Civic, Nissan Sentra and Ford Focus, the new Corolla stands out for its fresh, athletic styling, as well as its roomy, feature-rich interior. The LE Eco even offers best-in-class fuel economy. Add Toyota's outstanding reputation for reliability, and the 2016 Corolla deserves a place at the top of every compact car-shopper's list. This model sets itself apart with Sporty looks, affordability, reliability, fuel efficiency, and standard features Thank you for taking the time to review one of our pre-owned vehicles. We have many! As one of the largest pre-owned dealerships in Rhode Island, we are committed to providing you with a purchase experience that will WOW you. If we fail to meet your expectations in any way...please let me know. Thank you. Mike O'Connell, General Manager. This 2015 Toyota Corolla LE Plus is offered to you for sale by Balise Toyota of Warwick. This wonderfully fuel-efficient vehicle offers a supple ride, quick acceleration and superior styling without sacrificing MPGs. A Toyota with as few miles as this one is a rare find. This Corolla LE Plus was gently driven and it shows. This gently driven vehicle has been well-kept and still has the showroom shine. More information about the 2015 Toyota Corolla: The Corolla has been volume leader for Toyota for several years, and the latest version offers buyers even more bang for their buck. In a crowded compact segment, against the Honda Civic, Nissan Sentra and Ford Focus, the new Corolla stands out for its fresh, athletic styling, as well as its roomy, feature-rich interior. The LE Eco even offers best-in-class fuel economy. Add Toyota's outstanding reputation for reliability, and the 2015 Corolla deserves a place at the top of every compact car-shopper's list. This model sets itself apart with standard features, Sporty looks, affordability, and reliability, fuel efficiency Thank you for taking the time to review one of our pre-owned vehicles. We have many! As one of the largest pre-owned dealerships in Rhode Island, we are committed to providing you with a purchase experience that will WOW you. If we fail to meet your expectations in any way...please let me know. Thank you. Mike O'Connell, General Manager. Check out this gently-used 2016 Toyota Corolla we recently got in. Why spend more money than you have to? This Toyota Corolla will help you keep the extra money you'd normally spend on gas. With less than 33,686mi on this Toyota Corolla, you'll appreciate the practically showroom newness of this vehicle. Beautiful exterior. Clean interior. This Toyota Corolla is so immaculate it is practically new. More information about the 2016 Toyota Corolla: The Corolla has been volume leader for Toyota for several years, and the latest version offers buyers even more bang for their buck. In a crowded compact segment, against the Honda Civic, Nissan Sentra and Ford Focus, the new Corolla stands out for its fresh, athletic styling, as well as its roomy, feature-rich interior. The LE Eco even offers best-in-class fuel economy. Add Toyota's outstanding reputation for reliability, and the 2016 Corolla deserves a place at the top of every compact car-shopper's list. This model sets itself apart with Sporty looks, affordability, reliability, fuel efficiency, and standard features Thank you for taking the time to review one of our pre-owned vehicles. We have many! As one of the largest pre-owned dealerships in Rhode Island, we are committed to providing you with a purchase experience that will WOW you. If we fail to meet your expectations in any way...please let me know. Thank you. Mike O'Connell, General Manager. Contact Balise Toyota of Warwick today for information on dozens of vehicles like this 2016 Toyota Corolla LE. Why does this vehicle look so great? The Autocheck report shows it's only been owned by one owner. This vehicle was engineered to be both economically and environmentally friendly with exceptional fuel efficiency. This low mileage Toyota Corolla has barely been touched. It's the next best thing to buying new. This gently driven vehicle has been well-kept and still has the showroom shine. More information about the 2016 Toyota Corolla: The Corolla has been volume leader for Toyota for several years, and the latest version offers buyers even more bang for their buck. In a crowded compact segment, against the Honda Civic, Nissan Sentra and Ford Focus, the new Corolla stands out for its fresh, athletic styling, as well as its roomy, feature-rich interior. The LE Eco even offers best-in-class fuel economy. Add Toyota's outstanding reputation for reliability, and the 2016 Corolla deserves a place at the top of every compact car-shopper's list. Strengths of this model include Sporty looks, affordability, reliability, fuel efficiency, and standard features Thank you for taking the time to review one of our pre-owned vehicles. We have many! As one of the largest pre-owned dealerships in Rhode Island, we are committed to providing you with a purchase experience that will WOW you. If we fail to meet your expectations in any way...please let me know. Thank you. Mike O'Connell, General Manager. Check out this gently-used 2016 Toyota Corolla we recently got in. Why does this vehicle look so great? The Autocheck report shows it's only been owned by one owner. Outstanding fuel economy and sleek styling are two great reasons to consider this Toyota Corolla. The Corolla LE has been lightly driven and there is little to no wear and tear on this vehicle. The care taken on this gently used vehicle is reflective of the 15,197mi put on this Toyota. Pre-owned doesn't have to mean used. The clean interior of this Toyota Corolla makes it one of the nicest you'll find. More information about the 2016 Toyota Corolla: The Corolla has been volume leader for Toyota for several years, and the latest version offers buyers even more bang for their buck. In a crowded compact segment, against the Honda Civic, Nissan Sentra and Ford Focus, the new Corolla stands out for its fresh, athletic styling, as well as its roomy, feature-rich interior. The LE Eco even offers best-in-class fuel economy. Add Toyota's outstanding reputation for reliability, and the 2016 Corolla deserves a place at the top of every compact car-shopper's list. Strengths of this model include Sporty looks, affordability, reliability, fuel efficiency, and standard features Thank you for taking the time to review one of our pre-owned vehicles. We have many! As one of the largest pre-owned dealerships in Rhode Island, we are committed to providing you with a purchase experience that will WOW you. If we fail to meet your expectations in any way...please let me know. Thank you. Mike O'Connell, General Manager. This 2017 Toyota Highlander LE is offered to you for sale by Balise Toyota of Warwick. The Autocheck report for this 2017 Toyota Highlander LE highlights that it's a One-Owner vehicle, and for good reason. A One-Owner vehicle gives you the feel of owning a new vehicle without paying the new car price. On almost any road condition, this Toyota Highlander LE offers solid performance, reliability, and comfort. Enjoy safety and stability with this all-wheel drive vehicle and drive with confidence in any condition. This low mileage Toyota Highlander has barely been touched. It's the next best thing to buying new. Although this 2017 Toyota Highlander LE is technically a pre-owned vehicle, the clean and spotless interior could fool even the toughest critic. Thank you for taking the time to review one of our pre-owned vehicles. We have many! As one of the largest pre-owned dealerships in Rhode Island, we are committed to providing you with a purchase experience that will WOW you. If we fail to meet your expectations in any way...please let me know. Thank you. Mike O'Connell, General Manager. As seasoned Rhode Island drivers know, Toyota reliability is no myth; in fact, Toyota led the rankings for Consumer Reports’ Top Reliability for an astonishing eight years running. And we can only assume these high rankings will continue on, because this brand shows no signs of slacking on their commitment to creating durable, strong, and safe new vehicles. But what does this mean for drivers in Warwick, Providence, Cranston, North Kingstown, and Pawtucket RI who are shopping on a budget, and simply can’t–or don’t want to–buy a new car? At Balise, we offer pre-owned Toyota models from now and yesteryear, so you can get the right balance of practical cost and performance for your unique needs. With a used Toyota Camry, Corolla, Tacoma, RAV4, or Highlander, you get all the benefits of Toyota reliability with the wallet-friendly cost of a used car. It’s a win-win. Explore all of our pre-owned models here, or stop by our Warwick dealership to check out the used sedans, hatchbacks, trucks, convertibles, and SUVs for yourself. If we don’t have exactly what you’re looking for in stock, we encourage you to take advantage of our Car Finder App. You tell us what you want, and we’ll hunt it down for you! Still browsing? Want to compare to other pre-owned vehicles? Head over to our full used car inventory for a complete list of what we’ve got in stock.